This is my second post for the day. I am writing it because I am upset about what has happened to the owners of GJN. I would hope that the recipient of the swap termination fee will soon return all of the money received from the GJN trustee. If not I will pray that those with means are investigating their legal options now against the trustee, swap counterparty, all individuals and companies that played a role in the computation of the swap termination fee, and possibly J P Morgan, for the reasons discussed in this post and my previous one on the same subject. I did not own GJN at the time of its redemption. I have nothing but contempt for every person who had any involvement in screwing the owners of the synthetic floater GJN. I would hope that all readers of this blog share this contempt. In every other case involving a trust certificate, the owners of the trust certificate received, at a minimum, the par value of the security and any accrued interest at the time of redemption. This would be the case whether the trust certificates were redeemed by the owner of the call warrant or a redemption of the underlying security by its issuer. When GJN was redeemed, the trustee made a swap termination payment to the swap counterparty of $10.9683 per trust certificate leaving the GJN owners with $14.6857. For purposes of this discussion, I am assuming that Wachovia was the swap counterparty at the time of GJN's redemption since it was so listed in the prospectus. GJN Prospectus Wachovia was later acquired by Wells Fargo. The JPM TP had a 5.850% fixed coupon and matured in 2035. I use the past tense since the trigger for the unfortunate series of events about to occur was JPM's redemption of that security. The Swap Counterparty does not bear the risk of a JPM default or a deferral of the TP's interest payments. That risk was borne entirely by the owners of GJN. Recently, the swap counterparty has enjoyed a nice risk free return representing the spread between the interest payable by JPM and the 3% minimum coupon. However, a rise in the three month treasury bill rate to over 2% would trigger an increase in Wachovia's (now part of WFC) payment to the trustee. And, a rise to over 4.85% would require Wachovia to dip into its own pocket. It would be reasonable to predict a 5% average three month treasury bill rate over the next 23 years based on past history. Historical three month treasury bill rates can be downloaded at FRB: H.15 Release--Selected Interest Rates--Historical Data. Just look at the three month interest rates starting in 1989. So, while Wachovia's swap had some value recently, it most likely would have little or no value over a 23 year future period, particularly when that stream of income is discounted to its present value. Yet, somehow, someone arrived at that absurd $10.9683 per Trust Certificate termination payment. That could not have been done using the past as prologue and then discounting the number. 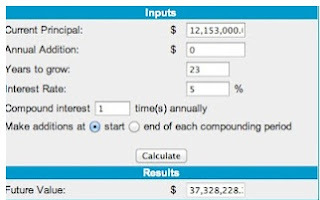 The trustee apparently paid the swap counterparty a $12,172,820.40. ($10.9683 for 1,108,000 TCs-Last Trustee Distribution Statement) That money can be earning money for the next 23 years. This is nothing more or less than an outrage. While I have not done any legal research on this subject, I would assume that some owners of GJN are investigating their legal options. In addition to the obvious targets, which would include the Trustee and the Swap Counterparty, I would suggest including every person and firm who had any role in producing that number for the swap termination fee. This seems to be a very ripe area for investigation. Another possible target would be J P Morgan. If no make whole payment was made by Morgan when it redeemed the underlying security, I would not assume that this was proper. I would recommend research on the following: Can JPM avoid the make whole payment by claiming an exception for a Capital Treatment Event when it can still treat the TP as TIER 1 Equity Capital? There is a phase out period for large institutions with over 15 billion in assets. When does that phase out period start? And can a case be made that JPM had to wait until the phase out period started before it could use the Capital Treatment Event escape hatch? I do not believe the phase out begins until 1/1/13. In my prior post, I briefly mentioned some legal theories that need to be explored further. That was not meant to be a comprehensive list. The gist of the matter is that the owners of trust certificates have a right to expect that they will receive at a minimum par value plus accrued interest. Sometimes, though not always, this is expressly stated in those few TCs that have swap agreements. If there was a make whole payment due to an early redemption by the issuer, then that could flow to the swap counterparty as their payment for early termination. The recent actions of the GJN and its swap counterparty have upset that balance and expectation. The press probably needs to be contacted so that Wells Fargo/Wachovia (or whoever owned the swap agreement at the time of redemption) can have an opportunity to explain their actions more fully to the investors. When I was practicing law as a trial and appellate lawyer, I would gladly research this kind of issue in preparation for filing a lawsuit, assuming I already had a client. I never went looking for a client. This is the kind of matter that the LB really enjoyed sinking its teeth into, figuratively speaking of course. Since I am retired, I can only hope that other lawyers are already exploring potential legal claims against the trustee, the swap counterparty, J P Morgan and everyone involved in the computation of the patently bad faith swap termination fee. If not, it would be unfortunate to the those investors who were screwed by the Wall Street Dickheads. This is not something that I would take laying down, if I had an economic stake, but I sold out of GJN (150 shares) back in April. I am curious why the swap counterparty would even contemplate screwing the owners of GJN in such a flagrant fashion. Sure, if JPM had made a premium payment under the make whole provision, which apparently did not happen due to an escape clause involving a "capital treatment event", few would complain about that specific amount flowing through to the swap counterparty, provided the TC owners received their par value. One question that I would ask them, as a reporter, is how much would it cost them now to accept nothing for the termination of the swap agreement and to allow the GJN investors to receive all of the liquidation proceeds of the underlying JPM trust preferred security which they clearly contemplated based on the GJN price action until the extremely late redemption notice screwing? I would also be curious how anyone could place a good faith value on the swap, when the three month treasury bill rate has historically been all over the place and an increase above 2% would trigger an increase in the payment owed by the swap counterparty. Now, can someone tell me in good faith what the average three month treasury bill will be over the next 23 years? Maybe I will contact the WSJ on this matter, someone needs to do it so that WFC can explain itself, unless they turn righteous soon, do what is right, which would be aberrational event worthy of note for a large financial institutions in the U.S. who seem to be hell bent on separating American citizens from their money in a variety of creative and destructive ways. Later this evening, I did send an email to the NYT's columnist Floyd Norris on this subject. As previously mentioned, if the three month bill was over 4.85% on the pertinent computation date, the swap counterparty would lose money. How many times over the past 23 years has the 3 month treasury bill been over that level? I counted 97 months. I made the following snapshots since 1989. Keep in mind, that at 3.85% on the three month T Bill the spread shrinks to just 1%. The maximum rate payable by the swap counterparty was 8% which would be hit at a 7% three month T Bill rate. The swap counterparty could have to pay out of its pocket up to 2.15% annualized for every monthly where the three month T Bill was over 7% (1.5% when over 6%). I counted 20 such months in the foregoing snapshots. With this kind of variation, the only possible good faith estimate would be possible in my opinion if the agreement had no more than three years left in the remaining term, and that would be possible only because of the Fed intends to keep the Federal Funds rate near zero during that period of time. The foregoing snapshots of the historical three month treasury bill certainly warrants an investigation into the persons making the calculation of the swap termination fee and any possible facts that would prove collusion. Given the number of holders of GJN, a class action lawsuit on their behalf would be the proper method to seek redress against the reprehensible actions connected with the redemption of this security.